Description: I have two partial Vaughan Flex-tred tractors. A model E and a model E2. This is a a project. These are both failed home brew ride on conversion failures. This is not a simple assemble and it will start project. One walk behind tractor could be built OR the owner could complete the ride on conversion to their own specifications. Both engines are stuck, I am not sure how stuck as I have not investigated that deep. I bought these tractors as a pair for a few spare parts that I wanted (The clutch and main shaft through the transmission of the E and the Extensions off of it and the Intake manifold off of the E2 as it was nicer than the one on the other E2 I assembled from boxes). As I want to be very upfront and honest with the buyer, I have made up a list of what this project entails and what to expect. I built my first Flex Tred from a similar list of parts. - parts to build a Schebler D2 carburetor (will need a float and maybe a couple of fittings, all of which are readily available). -Neither tractor has an original rear axle, though this can be easily made. -As these tractor have changed hands multiple times throughout their lives, there are broken off bolts that will need to be extracted. -Neither tractor has a radiator, this was a factory option that had to be bought by the original owner. 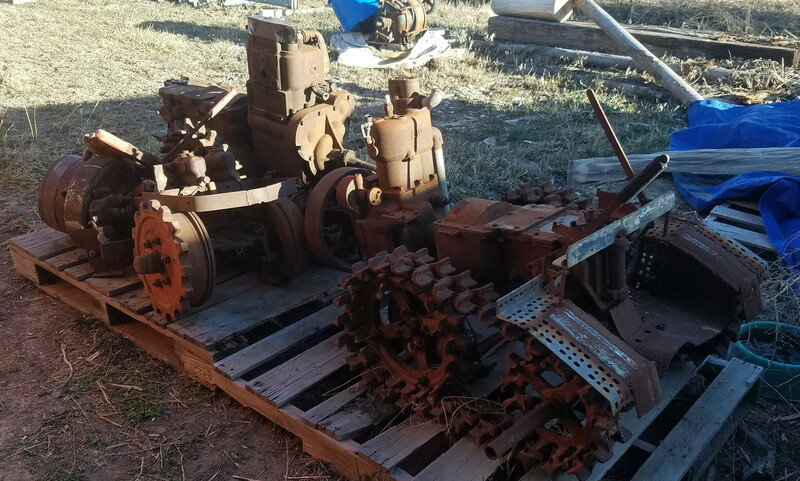 I am more than milling to provide whatever detailed pictures and measurements might be needed by the new owner as they work their way through this project. For whatever reason, I always seem to drag home "tractors in a box" and have so far built 10 tractors via that methodology. As I have already built an E,E-1, and E-2 following the tractor in a box method, I have decided to pass this on to the next person (I have other tractors in boxes I would like to build). Make me an offer. I WILL NOT be offended by your offer, just send me a private message. I would really like to see this project completed by someone, rather than sit in my pasture and wait for the day I "may have time." This is a project it'll take some work, but for someone wanting a Vaughan for a bargain price, this is your opportunity. If no one wants to take on the project, I am MORE than willing to part these tractors out. I can provide additional pictures per request.